Araneus seminiger, a spider mimicking foliose lichens. This individual did not move on lobes of Rimelia clavulifera growing on the trunk of Benthamidia japonica when HH took photographs of it on a winter day. / Photo by H.Harada; 310 m elev., Mt. Kiyosumi-yama in the Boso Peninsula, Chiba-ken, central Japan; 16 Jan. 2014. Sakata A., Harada H., Yamamoto Y. 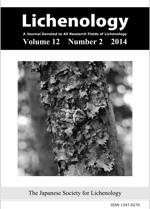 & Hara K.: The taxonomic study on the lichen family Roccellaceae (Ascomycota, Arthoniales) of Japan (2). Graphidastra japonica sp. nov.